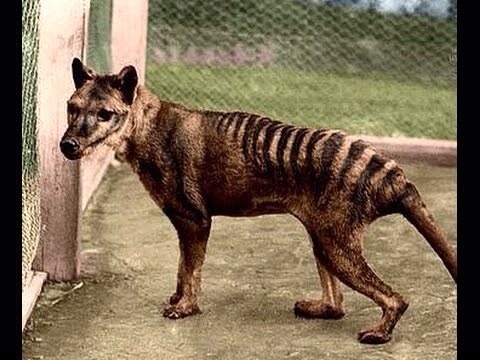 The Tasmanian tiger or thylacine became extinct over 80 years ago when the last living specimen died at the Hobart Zoo in Washington D.C. in 1936. But with the aide of gene editing and pickled thylacine pups, scientists may literally bring this awesome creature back to life again! In December of 2017, scientists from the University of Melbourne sequenced the entire genome of this extinct Australian beast using thirteen thylacine joeys preserved in alcohol. Such information could within the next decade be used to bring the unique marsupial back from the dead, with gene-editing used to bridge the gap between thylacines, which have no living relatives, and other existent species. 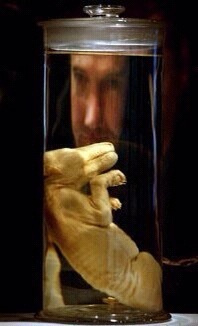 …and wouldn’t “Pickled Thylacine Pups” be a great name for a band?! This entry was posted on May 4, 2018 at 10:07 am and is filed under animals, furry, science. You can subscribe via RSS 2.0 feed to this post's comments. You can comment below, or link to this permanent URL from your own site. *Now playing @ a multiplex near you. This has been a self-serving crossplug. They’re working on restoring mammoths, too, but I’d be happy with a dire wolf!